Unifor President Jerry Dias, left, and Prime Minister Justin Trudeau, seen here in a file photo, met Tuesday to discuss GM's decision to close its Oshawa plant. OTTAWA — The head of the union representing workers at General Motors' car plant in Oshawa, Ont., argued Tuesday that the company's decision could lead to the collapse of the auto-parts industry in Canada and demanded a sharp response from the Trudeau Liberals. 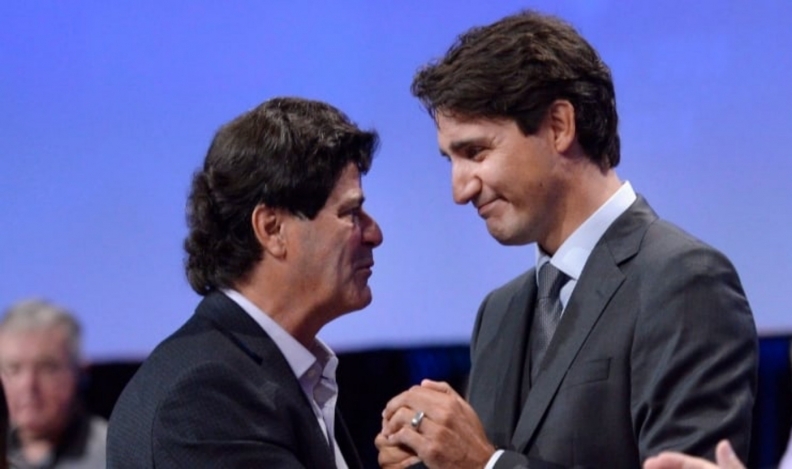 Unifor president Jerry Dias said General Motors "just showed the president of the United States and the prime minister of Canada their middle finger" by moving production out of Canada and the U.S. and threatening the jobs of about 2,500 workers he represents at the Oshawa plant. "We're playing with a corporation that plays by their own rules. So we have to have governments that are going to play by very strict rules as well," Dias said after meeting Prime Minister Justin Trudeau on Parliament Hill. "I mean, if you're going to have a company that's going to show us their middle finger, then I think our government should show them their middle finger as well." The revamped North American trade pact — which is set to be signed by the end of the week — should help eventually, but the parts that apply to the auto sector won't kick in for years and by then it could be too late, Dias said. A General Motors Canada executive said the company isn't planning to divest itself of its other Canadian enterprises as Dias claimed. David Paterson said the company is hiring 500 people for its technical centre in Markham, north of Toronto, to help write software for self-driving cars. "We sell in Canada, we manufacture in Canada, and we're actually the biggest and fastest-growing new technology automotive company in Canada," said Paterson, the company's vice president of corporate and environmental affairs. "We're growing faster than anybody in the industry in new technology, at the same time as we're unfortunately going through, next year, this really difficult change with regard to our manufacturing base in Canada." The tough talk minutes after Dias left a meeting with Trudeau, two of his cabinet ministers and officials from the Prime Minister's Office underscored the union's fury at the company's decision to close plants in Oshawa and the United States and slash salaried and executive staff as part of a global restructuring meant to save the company US$6 billion annually. Chantal Gagnon, a spokeswoman for Trudeau, said the two men discussed their respective talks with GM, and Trudeau's call with Trump earlier Tuesday about the auto industry "and how best we can stand up for people affected on both sides of the border." "Obviously our focus is on the families right now, making sure we are supporting the folks who are facing difficult times," Trudeau said. "We are talking about keeping the plant open, period. Our members in Oshawa want their jobs. They're not looking to be retrained," he said. And he suggested that despite his talk of helping workers facing layoffs, Trudeau doesn't believe the closure of the plant is a fait accompli, either. Asked if anyone from Trudeau's office tried to dissuade him from doing that, Dias bluntly said the Liberals were smarter than that.